If you are looking for wasp or bee removal in the Hamptons or Eastern Long Island, Twin Forks Pest Control is your go-to source to get rid of these pests from your home or yard. As spring and summer roll around, the peak season starts for bees and wasps to come out of hibernation and start colonizing and gathering pollen for their hives. Sometimes you can be in the unfortunate situation where a hive is created right on your property resulting in an infestation of these pesky insects. 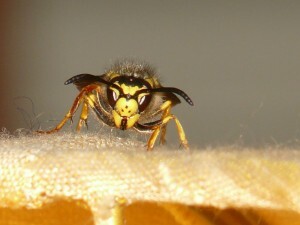 Bees and wasps can be a nuisance to your family and guests of your home and in addition to their painful stings and bites, they can be dangerous to certain people. It is estimated from the World Allergy Association that 1%-7% of the general population experiences immediate systematic reactions from bee stings or bites. These reactions can range from an outbreak of hives to complete anaphylaxis which is a potentially life-threatening allergic reaction where one’s throat closes completely causing them to be unable to breathe. To avoid any unfortunate circumstances like these, it’s the best course of action to solve the problem at the source and get the bee, wasp, hornet or yellow jacket nests on your property removed. Carpenter bees are a subspecies of bees that need particular attention. Rather than harming you or your guests these bees are actually docile but cause damage in other areas. As their name suggests, carpenter bees burrow into wood to build their nests. When this wood happens to be the structural wood of your home this can cause a score of issues. Carpenter bees have been known to target decks, porches, fascia board, support beams and other exposed wood. Carpenter bees are often mistaken for bumblebees as they have similar body size, however, you’ll never find bumblebees tunneling in your home’s wood. It is advised that immediate action is taken when you discover carpenter bees in your home because, like termites and carpenter ants, a lack of intervention could lead to serious and costly structural damage. Twin Forks Pest Control will neutralize and eliminate infestations of carpenter bees in the wood of your property. The old adage “the right tool for the right job” applies completely to the topic of bee and wasp removal. In order to get rid of the yellow jacket, wasp or hornet nests that have developed on your property we turn to our professional dust (called deltamethrin) in order to successfully clear out a nest. In certain cases, we use a special pesticide which gets rid of the intruders but is safe for your family in the yard. Honeybees and bumble bees are not aggressive not like their counterparts. These two species of insect actually provide the natural benefits of cross-pollinating the plants of Long Island. As such, if you are experiencing these kinds of bees we work with local beekeepers to relocate the bees so they aren’t harmed but are also off your property. If you are in need of bee or wasp removal in the Hamptons or Eastern Long Island, don’t wait. Call us today at the appropriate phone number of your area or fill out our contact form for a free estimate on our removal services so Twin Forks Pest Control can help you rid your property of these pesky pests so you can enjoy your yard in peace. From East Quoque to Jamesport, Twin Forks has you covered.